Our Slimline-B battery room thermostat offers a viable upgrade route for those with a dial thermostat working on a two wire system. The Slimline-B is surface mounting and requires 2 AAA batteries with a battery life of at least 12 months. Optimum Start is standard on the Heatmiser Slimline-B, a feature whereby the thermostat calculates the amount of heat up time required. The Heatmiser Slimline-B is powered by 2 AAA batteries. 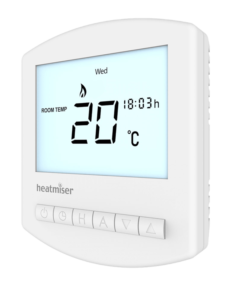 The Heatmiser Slimline-B features optimum start, a feature were the thermostat calculates the amount of heat up time required. Our battery thermostats are surface mounted for easy installation, making them perfect for the retrofit market. The Heatmiser Slimline-B offers flexible programming, by offering 5/2 day and 7 day programming modes. The Heatmiser Slimline-B offers a temperature hold facility, allowing a desired temperature to be held for a specific duration. The Heatmiser Slimline-B offers a holiday function, whereby the Slimline-B will maintain the frost temperature for the duration of the holiday.